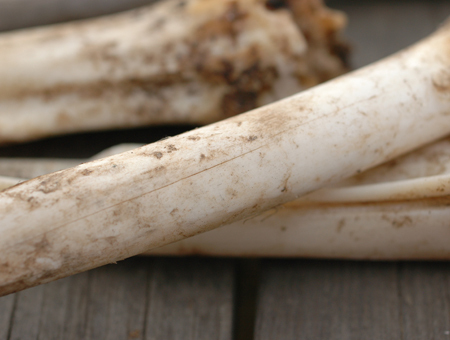 Bone is a beautiful and useful material, but if you pick up any random bone from the yard, or one that has been buried, it may very well be cracked. That is because bones contain quite a bit of water and, like wood, when drying bone is subjected to stresses caused by shrinkage. Something has to give if the stress is high, and the bone will start to come apart along the grain forming “checks”. Rules similar to those for drying wood without checking can be applied to bone. Typical cracking along the grain of the bone. 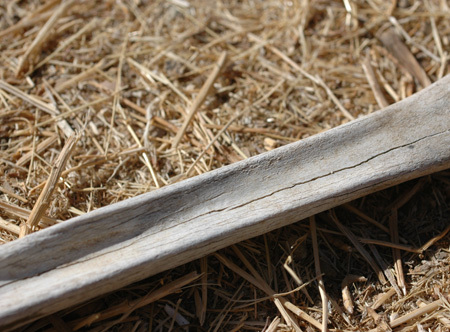 Bone, like wood, has a grain direction. Size matters: Like a large piece of wood, a large bone is more liable to crack than a small one. 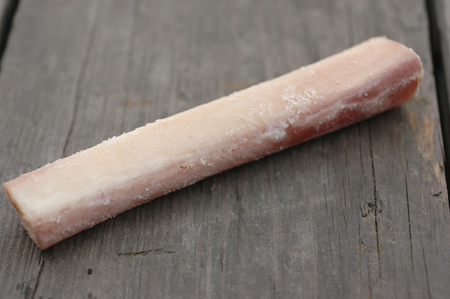 Small bones will often dry without cracking regardless of how they are dried. If I bury a leg and dig it up a year later, none of the small toe bones will be cracked, but most of the larger leg bones will have checks in them. Speed matters: Drying things fast causes more stress than drying things slow. That is because when things dry they shrink. As the outside, which is drying faster, shrinks, it has to shrink around the plumper, slower drying interior and cracks are liable to form in the outside. It helps quite a bit that bones are hollow. One way to decrease checking in wood is to bore a hole through the center. But, see next… Bone is very dense: Dense materials tend to check more easily than less dense materials. Very heavy dense woods are more liable to cracking in general than light porous woods for instance. So, even though bones generally have the advantage of being hollow, they still have a strong tendency to check if not dried in a controlled way. If a bone was at thick as a tree or split piece of wood, I doubt there would be much that you could do to prevent checking, or at least it would take extreme measures. Control drying: The best way to avoid checking is to control the speed of drying, and there are several ways to do this. *Humid environment: Drying in a humid environment slows moisture loss, and that’s what it’s all about. If the moisture loss is gradual, moisture from the interior of the bone has time to redistribute throughout the bone, resulting in more even moisture loss, which translates to less stress on the bone’s structure. *Slowing drying of the exterior with a coating: Coating the bone with something to slow the drying of the exterior will also allow the whole bone to dry at a more even rate, greatly reducing the likelihood of checking. Using animal fat is easy and effective. Fat can also seep into the bone replacing some of the water. This bone was not oiled, but just dried in the shade. It didn’t crack because the oil from inside the marrow seeped into the bone during the slow drying, replacing the water that was lost. Note the translucent look to it from being saturated with oil. Usually a little bit of boiling in a soap of some kind will strip out some of the excess oil making the bone appear white and opaque. This approach will often work, but isn’t as reliable as oiling the outside of the bone as well. Also, when this is cracked open to clean it or make it into something, that oil in there is going to be pretty nasty! This is just going to be used for scraping skins, so it probably will never be opened. *Boiling: I actually don’t know if this works, but boiling wood can reduce checking. I think it works by breaking down the cell structure of the plant allowing water to move from the inside of the wood to the outside. It seems to me that boiled bones have less tendency to check when drying, but that is a very casual observation and one I’m not willing to stand behind! Boiling a bone definitely removes some of the protein material that cements it together, so I don’t recommend long boiling for the most part, since it may weaken the structure, though I suppose it depends on what you are planning to use it for. Further experimentation is definitely needed. I would say that if other methods are used carefully boiling is unnecessary, but could be an alternative and is interesting regardless and who knows how knowledge might be handy. This bone is heavily checked from repeated wetting and drying as well as baking very dry in the sun. Also, there is no oil left in the bone after so much time and weathering. Also, bone is not like shell which is dead and made by deposition. Bone is living in the animal and contains proteins which bind it all together and make it strong. Bones contain enough protein that you can make glue from them. This bone has probably lost a lot of that protein to biodegradation, which leaves a deficit of material. If you only want a small piece of bone, just go out and find one and break it or cut it up. Examine it VERY CLOSELY for any checks if you are about to invest any significant amount of effort into making something nice. I speak from experience :-/ Bones, like wood, have a grain that runs longwise. If the bone is checked and it is cut across the grain, whatever you make might very well fall apart. If I want a bone completely unchecked for making tools or jewelry or something like that, here is what I usually do and it seems to work very well. 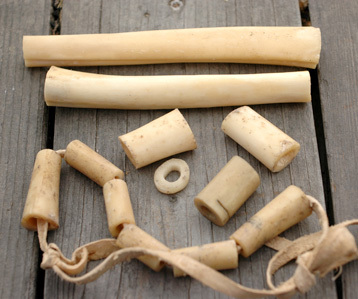 Like wood, fresh bone can form checks very quickly in hot dry weather, and I mean within minutes, not hours, so don’t leave them in the sun, and don’t procrastinate too much. Again, this depends on the bone’s character, size, thickness, the weather etc… but just be warned that it can happen very fast. Saw off the ends if you don’t need them. Clean out the marrow with a stick. This allows the interior of the bone to dry along with the outside, which means more even moisture loss and less checking. 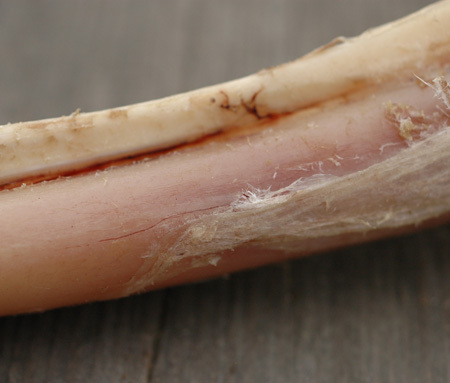 Plenty of marrow oil will usually stay inside the hollow portion of the bone. Scrape the outside of the bone clean with a knife or stone flake. Oil heavily, preferably with a heavy tallow type of oil such as that from deer, goat, elk, moose, sheep, antelope or cattle. Put it on really thick. Deer bone from this year’s buck oiled with rendered deer tallow. Deer tallow is so thick that it acts almost like a wax, resulting in very slow drying. If using a lighter oil, like lard, bear, raccoon etc, or if the bone is very large and thick, you may want to put the bones in a plastic bag for extra insurance. Don’t seal the bag. Leave it very slightly open, or poke some holes in it to let moisture escape slowly. This may not be necessary, but is good insurance and easy enough to do. Keep out of the sun or very hot areas, to assure slower drying. That’s it! I’ve seasoned many bones successfully this way and actually can’t recall any failures. By contrast, bones left lying about will generally form checks unless they are very small or thin. I have a small collection of seasoned bone that I keep around. When I run across a really nice thick walled bone that I might want to use for something later, I’ll season it out as above and store it for eventual use. It’s also good to know that fresh bone is much easier to work that seasoned bone! If you just keep a little oil on the bone and work in the shade, you can make your item out of fresh green bone and then oil it to season out when you’re done. A few of my stash of seasoned bones for making stuff. I wish I had some pictures of all the cool bone stuff I’ve made over the years, but I don’t. It’s good to know how things work too, whether we need that knowledge or not. And you never really know when some seemingly obscure knowledge might come in handy or shed light on something seemingly unrelated. That is like me wishing I had pictures of all the leather work I did 20 years ago. In particular a carved bodice I wish I’d not given away. Awesome, I had no idea! I have a pig shoulder bone that is raw that I wrapped in foil and tossed in the fridge till I could figure out how to dry it right so it wouldn’t check… Then I forgot about it… for a couple of months… Or 4. Well, it got moldy. Is this bone ruined or can I still clean it and dry it for later use? It doesn’t stink or anything, just some surface mold. I’m sure it’s fine, bones are very durable. a quick boil maybe to kill anything on there.